For eighteen years, Ben Franklin, the great American inventor, diplomat, and signer of the Declaration of Independence, was a tenant in a beautiful four story Georgian house at 36 Craven Street in London, mere blocks from the River Thames. As ambassador from the colonies, he entertained, lived, and even allowed other intellectuals of the time to stay at the house while he lived there from 1757 through 1775. Nearly 225 years later, as the house stood dilapidated and on the brink of collapse, a group called “Friends of Benjamin Franklin House” decided to renovate the building and turn it into a museum honoring one of America’s founding fathers. Work commenced, but only a month into the renovation, a construction worker named Jim Field made a startling discovery in the windowless basement: A human thigh bone sticking out of a dirt-filled pit. 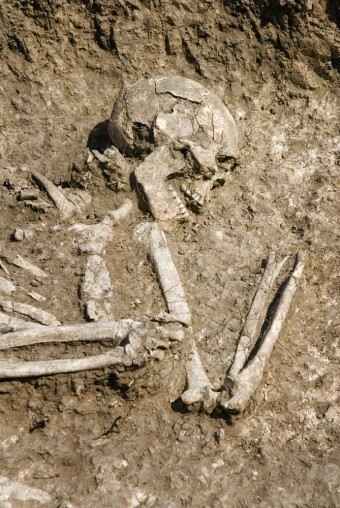 After further excavation (with the help of the London police), more than 1200 other bones – all dated from about 200 years prior – were discovered in this one meter wide and one meter deep pit. This begged the question, what were human bones doing in Ben Franklin’s house? Was one of our honored American heroes also the United States’ first serial killer? The short answer to that latter question is no. Mr. Franklin was a lot of things, but “murderer” wasn’t one of them. After the discovery, the “Friends of Ben” called in Dr. Simon Hillson and his team from London’s Institute of Archaeology at University College London. After a bit of research, and analyzing the remains, they soon came to the conclusion that the bones once belonged to William Hewson, an anatomist pioneer and “father of hematology” – the study of blood and blood diseases. So how did the bones end up in Ben Franklin’s basement? While studying at the University of Edinburgh in 1761/62 (the same university where Arthur Conan Doyle served as a clerk for Joseph Bell a little over hundred years later, with Bell becoming one of the individuals the character of Sherlock Holmes was based on), William Hewson caught the attention of the Scottish scientists and surgeons, the Hunter brothers . The brothers eventually named Hewson as an assistant and partner in their anatomy school, allowing him to continue his study of blood. In a famed experiment in front of the Royal Society in 1770, Hewson used the flow of mercury through a turtle to show how blood moves through the lymphatic system. This earned him high praise, election into the Royal Society and the Copley Medal (outstanding achievement in the physical and biological sciences). It also gained him a friend and admirer in Ben Franklin. I should think it no Trouble to hear their Complaints if I could be of the least Use in accommodating their Differences; but since that was not likely, I could only wish as I had a Regard for both, that they would go on to the End of their Term as quietly as possible, since that would be most to the Credit of both. With the partnership now broken, Franklin offered to let Hewson come live at 36 Craven and open his own anatomy school there. He accepted and his school officially opened at Ben Franklin’s residence in September of 1772. Among the bones found in 1998 at 36 Craven were the remains of fifteen different people, adults and children. They all showed dissection marks made by 18th century surgical instruments. A femur bone was found that was cut cleanly through, probably used to demonstrate the proper technique for amputation. Skull fragments showed drill holes likely made by a trepanning device, a pre-industrial revolution practice (though, rarely, still performed today) where holes were drilled into the skull to relieve pressure on the brain. Additionally, excavators found remains of several different kinds of animals, horses, cows, pigs, and even a turtle spine. It was clear that these remains were being used for medical and scientific study, but why didn’t Hewson properly dispose of them? Why was he going to great lengths to hide what he was doing? And where did these human remains come from? Throughout the Middle Ages and until late 16th century, dissections and autopsies were completely illegal in England due to lack of understanding of the medical necessity combined with religious objections. This gradually changed starting in the 17th century, when autonomical theaters were set up in many European cities for doctors and students alike to learn about the human body. These became giant spectacles and were hard to gain entrance to. In other words, dissection became part of the sentence. But dissection was only for those who had already had their demise planned for them by the state. As anatomy schools grew in practice (the first official one opened at Penn University in 1745 – the school founded by Ben Franklin), the demand for cadavers rose. There was no way the amount of executed convicted criminals were going to match the need for dissectable bodies. So, doctors, scientists, and surgeons turned to a less than savory practice – grave robbing. In a few cases, the shortage of bodies for medical professionals in Europe and America even spurred some to commit murder in order to sell the bodies to medical professionals. While it is not proven that William Hewson resorted to grave robbing (and he certainly didn’t murder anyone), it seems likely considering the range and amounts of bones he had that he at lest paid grave robbers for bodies, if not did the deed himself. In fact, the “Friends of Benjamin Franklin House” speculate that Hewson’s bodies came from “resurrectionists – bodysnatchers who shipped their wares along the Thames under cover of night.” To dispose of the bodies somewhere besides in a basement pit was to risk getting caught for illegal dissection and possible grave robbing. All in the name of science. As far as how involved Franklin was himself in these “illegal dissections” and the anatomy school, there is no evidence in either direction. It is even possible that Franklin had no idea that anything technically criminal was being done at the school in the house, though this seems a bit of a stretch, given he knew the work Hewson did and no doubt was well aware of resurrectionist practices to supply medical professionals with the bodies they needed for their work. That said, Franklin was in and out often and even when he was in London, he sometimes stayed at a different house owned by the same landlady. So perhaps he at the least wasn’t ever present for the transactions. We’ll likely never know. While the means with which Hewson acquired at least some of the bodies were likely illegal, the work he did was important. From 1772 to his death two years later, William Hewson made several discoveries related to the human body. He became the first person to observe lymphocytes’ production in the thymus and spleen. He became the first to describe clearly the three components of blood – red blood cells, white blood cells, and plasma. He correctly reported that red blood cells were disk-shaped, unlike his contemporaries who thought the cell was spherical. Our Family here is in great Distress. Poor Mrs. Hewson has lost her Husband, and Mrs. Stevenson her Son-in-law. He died last Sunday Morning of a Fever which baffled the Skill of our best Physicians. He was an excellent young Man, ingenious, industrious, useful, and belov’d by all that knew him….He was just established in a profitable growing Business, with the best Prospects of bringing up his young Family advantageously. Today, the “Benjamin Franklin House” on 36 Craven in London is open to the public as a museum. It is the last remaining of home of the man himself. William Hewson’s dissection bones are currently on display in the Seminar room in the house. As stated above, William Hewson received the Copley Medal from the Royal Society in 1770. It is still given today. Notable winners, besides Hewson, include Charles Darwin, Francis Crick (co-discoverer of the structure of the DNA molecule), Stephen Hawking, and Benjamin Franklin. Would “sexual access of all kind” not include necrophilia? And just how bad would 13 bodies in a 1m deep pit smell? This article doesn’t seem to want to touch on the reality that old bennie was fullly complicit. He was from a bloodline family afterall, they are big on human sacrifice. Having a budding ‘pathologist’ move into your house would be the best cover story ever! Smell? Probably not much…That’s why we bury the dead…avoids the stench of death, for the rest of us. If they were all in a one metre pit,common sense says they were bones only when they went in. Otherwise how would they all fit?So, no smell. If there was flesh left, I gather this house was on the banks of the Thames which at the time was very whiffy. But yes, obviously Ole Ben knew about it. Oh come on if this was just innocent why cover it all up? Why hide the bones in a pit? Why dig up your whole basement? C’mon David…It stated why in the article very clearly…human dissection and the practice of grave robbing was illegal at that time so even though it contributed much to the science of human anatomy, there was nothing “innocent” about it. Franklin founded the University of Pennsylvania, not “Penn University”. He also founded Pennsylvania Hospital, one of the, if not THE oldest hospitals in the US, and the first fire company in the US, and The Insurance Company of North America, also first in the US.